I've used my Tangle Teezer for a long while, since getting it I've not even thought about trying out another hair brush. When I heard about the Wet Brush I was intrigued, how can using a proper brush on wet hair not ruin your hair? I was sent one to try out and I was excited to give it a go and see for myself. I've been trying to grow my hair for ages and it's currently the longest it's ever been so I'm treating it as nicely as I can. 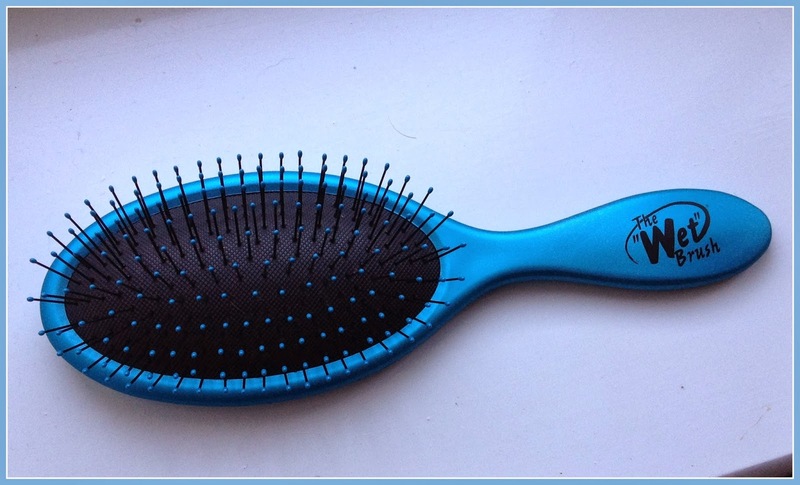 It has thin flexible bristles that are designed so they don't snag your hair. It's bigger than a Tangle Teezer and it actually felt nice to go back you holding a brush by the handle again! The Wet Brush has a rubber coating so you have a good grip while using it, which is perfect as it's designed to be used when wet! There's no worry of dropping it and you know that brushing out the tangles after shower won't be damaging your hair. It's available in a range of colours and works on both wet and dry hair without damaging your hair. It's a great brush for children who might have long hair that gets tangled. Because of the design it means you can easily get into harder to reach areas like underneath a ponytail. I always found it a bit difficult to use the tangle teezer for putting my hair up. The handle makes it much easier to hold. I don't think it will replace my Tangle Teezer completely but it will mean I have another brush to use. It will definitely be my go-to brush for up dos! I think once my tangle teezer give up I will go and get this brush instead, sounds like a good one to brush your hair with when its wet.